By now you've noticed that turns can be very tricky. On the preceeding flights, you kept your turns very shallow; but, if you managed to get into a relatively steep turn at one time or another, you probably found the airplane somewhat difficult to control. But flying won't be as much fun as it could be if you're always handling the airplane like a kid on his first bike—afraid to bank it sideways a bit for fear of tipping over. So, on this flight we'll work on turns. In addition, you'll need to be able to make standard rate turns in order to land properly from a traffic pattern. You'll just climb up over the South Shore of Long Island where it'll be safe to practice. That way you'll be able to focus all your attention on the maneuvers themselves—without having to worry about where you're going. Soon, you'll be wheeling the airplane around like a pro. Standard Rate Turns. At any given airspeed, the steeper you bank the wings, the quicker the airplane will turn. A standard rate turn is a turn in which the angle of bank is such that a 360° circle would take exactly two minutes. For that reason, it's also referred to as a two-minute turn. How steeply do you bank the wings to make a standard rate turn? That depends on your airspeed, but there's an instrument on your panel that saves you from having to guess. The Turn Coordinator. The round-faced instrument in the lower left corner of the instrument cluster is the turn coordinator. It shows the rear view of a miniature airplane. When you bank the simulator's wings during flight, the wings on the miniature airplane also bank, showing the rate at which you're turning. To turn at the standard rate, you'll bank the airplane's wings so that the wings on the turn coordinator are lined up with the tick mark on the edge of the instrument—the tick mark labeled L for a left turn, or the one labeled R for a right turn. If you keep the airplane banked so that the wings on the turn coordinator stay aligned with the tick mark, you'll be turning at this standard rate. At lower speeds you'll use shallower turns, but they'll still be standard rate turns if the indicator is aligned with the tick mark. Bank the wings to the left—gradually—while keeping an eye on the turn coordinator. The turn coordinator responds a bit slowly, so take your time as you establish a bank at which the indicator's wings are lined up with the tick mark. Nudge back on the stick (up elevator), to maintain altitude. With the wings banked this steeply, they lose some of their lift. As a result, when you start into the turn, the nose will begin to fall off, and the vertical speed indicator will reveal that you're beginning to descend. Therefore, to prevent a loss of altitude, you'll need to nudge the stick back slightly. Monitor the horizon and the vertical speed indicator, and use up-and-down nudges on the stick to prevent either a climb or a descent. The elevator has a tendency toward over-control, so you'll have to use up-and-down nudges on the stick (as you do while setting up for an approach) to prevent either a climb or a descent. Also, glance at the altimeter from time to time, as a check: You want to maintain your altitude throughout the turn. Maintain the correct bank by nudging the stick to the left periodically, as required. As the airplane turns, it will tend to level off some by itself, so you also have to nudge the stick left periodically in order to maintain the correct angle of bank. Begin to roll out of the turn 10- to 15-degrees beforereaching your final heading. Know in advance the heading you wish to turn to, and start the roll-out early enough to end up right on that heading. Thus, as you turn, in addition to watching the position of the horizon, you'll glance back and forth between the turn coordinator and the vertical speed indicator, with an occasional glance at the altimeter as well. Set-Up Parameters. Enter the following set-up parameters to get started. You'll be departing on Runway 6 this time, so taxi ahead, then make a 180° turn to the left, onto the runway threshold. Departure and Climb. Your departure heading from Runway 6 will be 059°. Complete your takeoff procedures; climb to 400 feet above the airport (499 feet on the altimeter); and establish a 500fpm climb. As you climb away from the field, start a shallow turn to the right, to heading 180°. That will take you toward the South Shore of the Island, with the Atlantic Ocean beyond. Continue climbing, to 3000 feet; for practice maneuvers it's desirable to put a little distance between the airplane and the ground. You're still climbing as you approach the shore. Begin a shallow right turn now, so as to fly right above the beach. Your heading will be about 280°. Level off when you reach 3000 feet. The Practice Area. The shoreline is straight for a while, and ahead there's a small, blunt point jutting out into the ocean. Beyond the point the shoreline is straight again, and that straight section of shoreline just beyond the point is where you're going. Highway 27 will be visible in the distance, with Republic Field over to the right. As you cross the base of the point, turn right slightly, and fly directly over the next straight stretch of shore. Take up a heading of 270°. On that heading, the shoreline will appear as an almost (but not quite) perfectly-vertical line down the center of the windshield. Practice 360s. Let's do a full-circle, 360° turn to the left, out over the ocean. First, tap the key to save the current flight parameters; should you lose control and crash, the simulator will put you right back at this point so you can try it again. Gradually bank the wings left, aligning the wings on the turn coordinator with the L tick mark. Nudge back on the stick, to maintain altitude. Control the nose with gentle up-and-down nudges on the stick, as required, while you monitor the vertical speed indicator and the horizon. Maintain the proper bank with leftward nudges on the stick, while monitoring the turn coordinator. Begin to roll out gradually when your heading comes around to about 255°, so you'll end up straight and level at your initial heading of 270°. About a 10- to 15-degree lead on the roll-out should work out right, depending on how quickly you do it, which really is a matter of developing your own style. Further Practice. You have the general idea, so now try a few more 360s, including some to the right. Then, starting from a heading of 270°, do a standard rate, 90° right turn, to heading 000°, which will take you inland. Try to time your roll-out so that you hit 000° on the nose. Now do a 180° left turn, which will take you back toward the shore. Finally, turn left again to 090°, which will take you back up along the shore the way you came. If you still feel up to it, you might try doing a figure eight around that point—but I'll leave that up to you. Descent and Approach to the Airport. As you return up along the coast, get the airplane set up for the approach, and begin your descent. You have quite a bit of altitude to lose before you land, so do another 360, to circle around while you descend. For this one, try doing it at the shallower half-standard rate—with the wings on the turn coordinator only half-way to the tick mark. Descend to 900 feet and level off while still well away from the airport. Make some additional turns, if necessary, to get down to 900 feet. Now use your overhead radar view to locate the field, and head directly for it. Your heading will be somewhere around 030°. Landing. For now, do a straight-in approach and land on Runway 6, the one you took off from. Your inbound heading on final will therefore be 060°. Try judging for yourself when to start the descent. 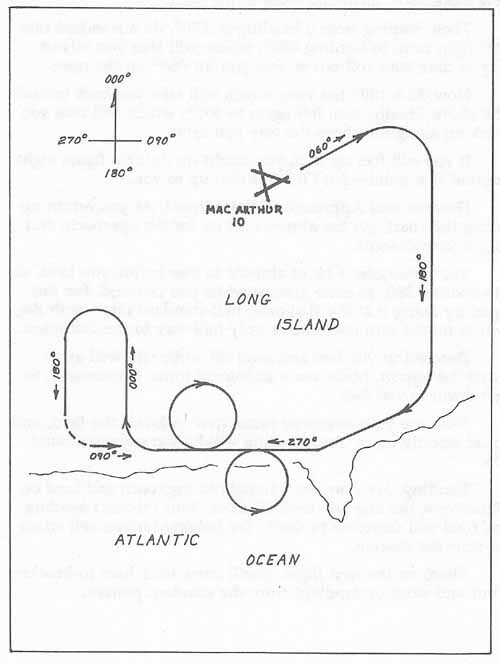 Then, on the next flight, you'll come back here to MacArthur and work on landings from the standard pattern.